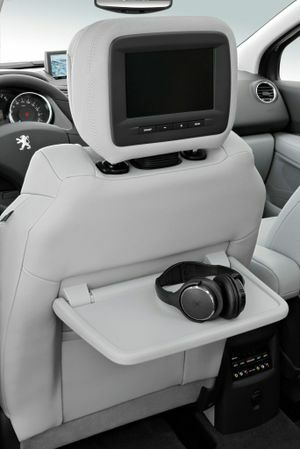 THE Peugeot 5008, the French car maker's contribution to the people-mover market, is testimony to the advantages which can be gained from not judging a book by its cover. It is not glamorous or ostentatious, just happy to do what it does well. One look at the 5008 and it is apparent it was built with space and comfort in mind and to this end the interior does not disappoint. Up front the seats are nicely supportive and large enough to accommodate larger manly shoulders with just the right amount of tilt and bolstering. Passengers in the middle row are similarly blessed with a comfy pew that reclines if you wish. There is space to stretch out, handy tray tables and excellent storage back there, too, although headroom is a tad hampered by the sunroof. Seats in the third row are a bit smaller, more upright and really the preserve of children unless the journey is a short one. Like the second row these seats fold easily with gentle encouragement. The petrol 5008 is powered by the same turbocharged 1.6-litre engine that does duty in the Peugeot 208 GTI and the Citroen Picasso. It is a competent unit and appears zippy and knowledgeable but not unsurprisingly struggles a bit under full load. Handling though is satisfyingly uncomplicated with the 5008 sticking to task without much urging. It is unusually nimble, is sure-footed when pushed quickly around tight corners and a dream to park. Ride quality is more than decent with the 5008 performing well on smooth bitumen and bumpy stretches. The steering often feels a bit free and easy but that is acceptable I suppose considering this is a people mover not a sports car. Both the diesel and petrol models share a single spec although such is the generosity of the inclusions that there is hardly room for complaint. Safety features include six airbags with curtain airbags in the third row, ABS with EBD and emergency brake assist, pre-tensioning and force limiting front seatbelts, collapsible steering wheel and side impact absorbent door padding. 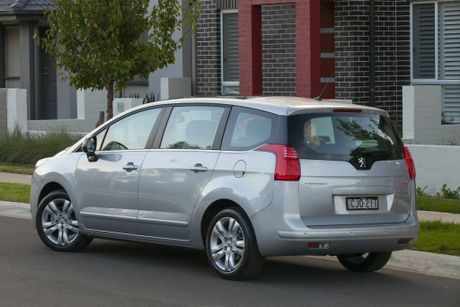 There is growing choice in the MPV market in Australia with the main competition coming from the Kia Rondo SLi (from $33,990), Honda Odyssey (from $37,200) and the Citroen Grand Picasso (from $39,490). 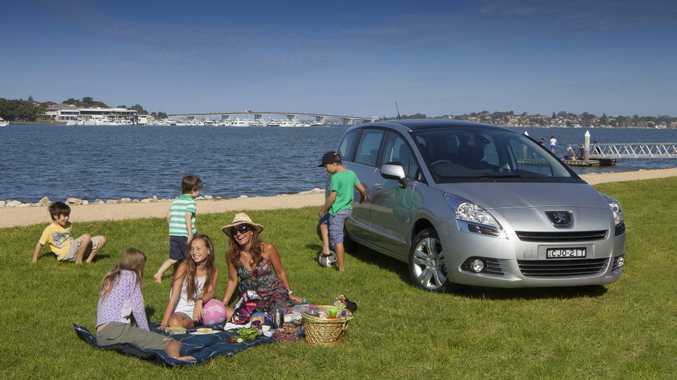 Of course the 5008 is an excellent choice for growing families with the option of seven ideal for those times you have to ferry the kids' friends. There is ample storage, nifty little extras like window blinds, tray tables and inbuilt DVD screens, and easy to use entry and exit points for busy families on the go. But the 5008 is also suitable to those active seniors and couples who need the space to carry bicycles or boards. With the second two rows folded flat the 5008 offers up 1754 litres of space and is able to accommodate items more than two metres long. Peugeot claims 7.6 litres/100km but in our week we battled to keep it below 10L/100km. We did do a fair number of small trips though and most of those under load so that is to be expected. Peugeot offers a three year or 100,000km warranty. There is capped price servicing for three years with service intervals are 12 months or 15,000km. While the 5008 wears a distinctive Peugeot face it is safe to say it isn't one of their more stylish vehicles. A streamlined shape adds some interest but its beauty lies within. What we liked: Space, comfort, visibility and excellent inclusions. What we'd like to see: Steering wheel controls, a bit more zip under load. Warranty and servicing: Peugeot offers a three years/100,000 kilometre warranty. Capped-price servicing for three years with service intervals are at 15,000km/12 months, $330 for each service. Details: Five-door, front-wheel drive medium people mover. Engine: 1.6 litre four-cylinder turbo petrol generating maximum power of 115kW at 6000rpm and peak torque of 240Nm @ 1400rpm. Consumption: 7.6 litres/ 100km (combined average). Bottom line: From $36,990 plus on-roads ($40,490 for diesel).